Every year Montreal draws thousands of visitors from around the world. To accomodate this constant migration of people to our city we have hotels for all tastes. 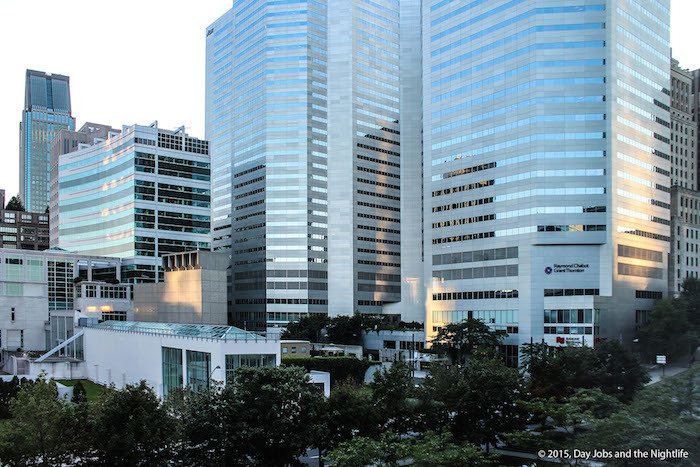 While some hotels are simply a place to store your stuff and get a good night’s rest, others stand out, making a visit to our city that much more memorable. Sitting at the pinnacle of refined elegance and sharp modern style is the W Montreal, the only hotel of its kind in Canada. We spent a night learning about why this hotel stands apart from the rest. 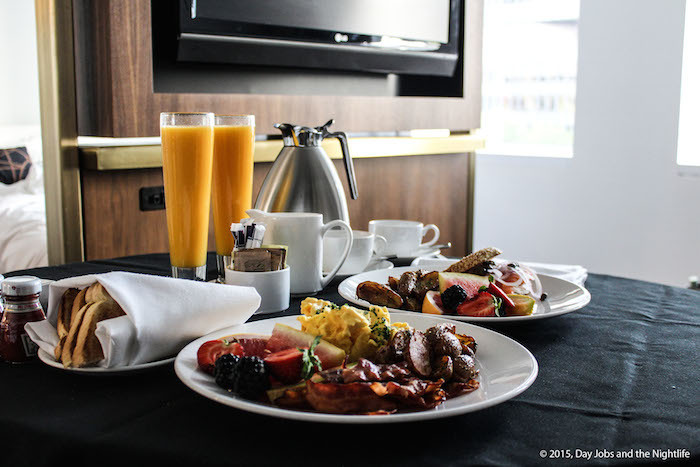 Read on to find out why it has become one of our recommended places to stay in Montreal. 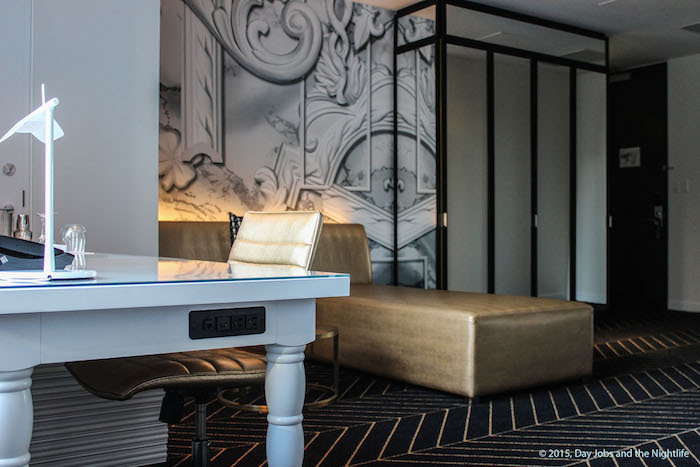 The W Montreal (part of the Starwood group of hotels) officially opened its doors 11 years ago and for the past couple of years they have been renovating and updating their rooms and suites, one level at a time. A renovation of this scope wasn’t an easy undertaking but the results yielded were worth all the heavy lifting. What we have now is a rejuvinated W. While fresh carpets and coats of paint have catapulted the hotel to the forefront of interior design, its their philosphy and dedication to offering their clients a inside look at our city that has them leading the way in our city’s hotel industry. Looking at the suites, we were treated to the biggest and brightest suite in the hotel for one exciting night (very aptly named Fantastic Suite). Those lucky enough to lay down their burdens and baggage in this room will enjoy an excellent view of Square Victoria and historic McGill Street. This area of Old Montreal is one of the finest neighbourhoods in North America and with 5 windows facing onto the busy streets, the term wow-factor never seemed more appropriate. The decor at the W Montreal has been updated with a focus on modern elegance. 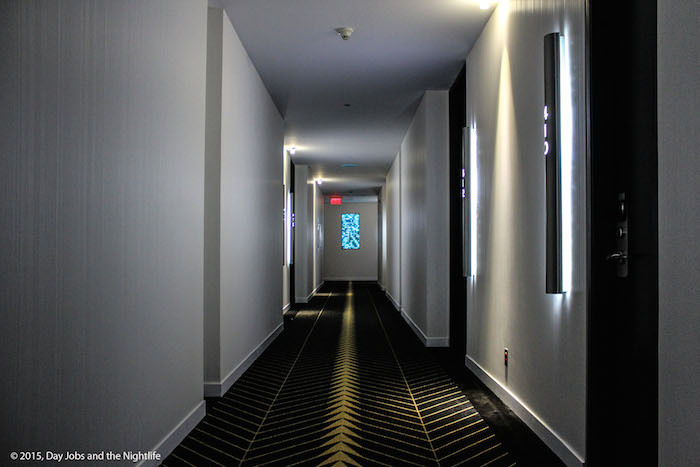 From the hallways right into the suites the colour palate is largely black, white, grey and gold. 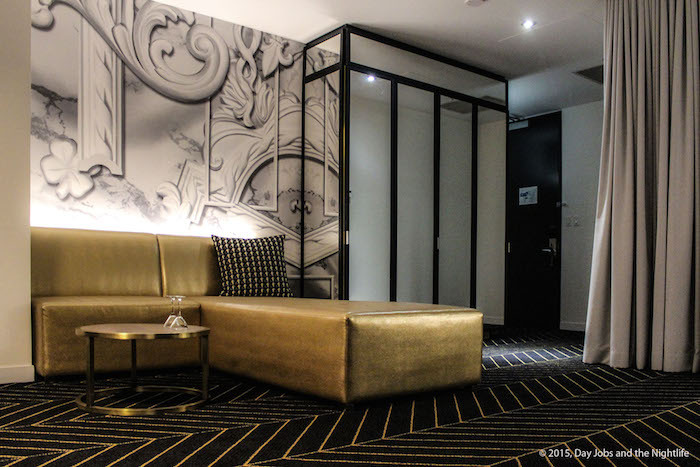 Our room featured a large (and very comfortable) king sized bed accompanied by white accent furniture and gold-coloured lounges, lined with brushed brass. A central television spins 360 degrees making viewing your favorite program from any angle of the room a piece of cake. On point with many trends currently flooding design magazines, stores and restaurants, the team behind this decor was definetly in the know when it comes to choosing the look of the room. Perhaps the most wow-enducing element of the room was the open concept bathroom. A large bathtub lay exposed in the middle of the room while wall to wall mirrors helped expand the feel of the space. An over head rain shower is tucked off to the side and two porcelain sinks give ample space for two busy people to get ready for their day or night. Making the bathroom a focus of the room is a brilliant idea and a far cry from how bathrooms are normally treated in lesser hotels. 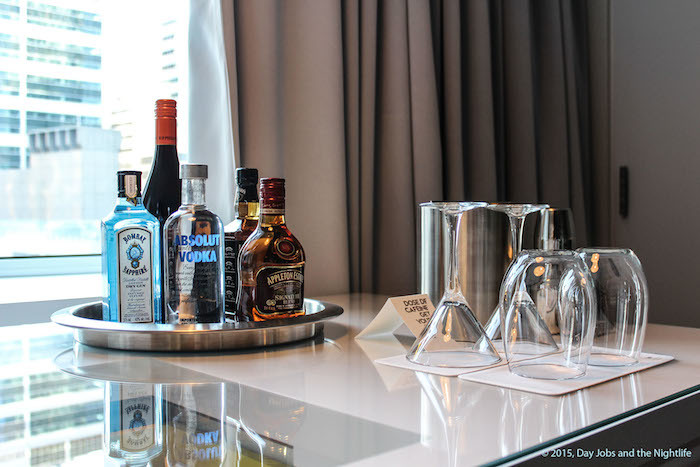 Going beyond treating guests to the upmost of design and comfort, the W Montreal has recently launched its Insider program. 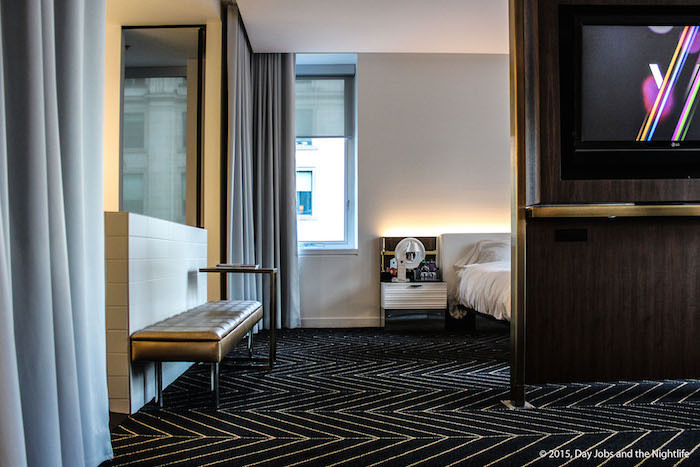 Guests of the hotel essential have their very own BFF in the city who can point them in the right direction for food, concerts, events and places to be in Montreal. We had the pleasure of sitting down with the W Montreal’s very own Insider, Caroline Khangi and she explained to us what Insider really meant. Going beyond the normal duties of a hotel concierge, the W’s Insider is there to help you plan the perfect party or get the right table for a romantic night on the town. She’s only a text or a phone call away. Deeply connected to Montreal’s vivacious social network, Caroline’s job as our Insider is to put the guests first and making them as happy and comfortable as possible in Montreal. It’s an impressive value added to a persons stay and in a world where everyone is trying to retain their best customers, the Insider is a simple yet very forward-thinking service that will keep people coming back for more. Check out this video featuring Caroline hopping around some of Montreal’s coolest hotspots! The W Montreal also features the wonderful AWAY spa where relaxation is next level (complete with champagne!). The hotel also features the wonderful Wunderbar, the Plateau lounge (a great place in Montreal to grab a cocktail) and Otto, the house restaurant. 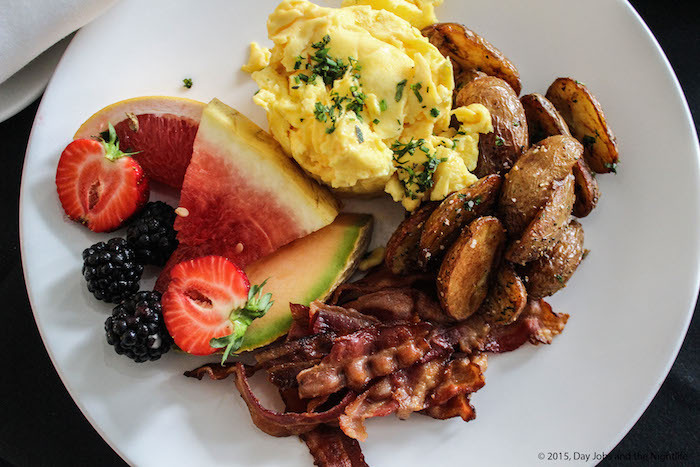 The restaurant’s breakfast is one of the best meals I’ve ever had in a hotel. There’s more to come for the W Montreal over the next few months. We got the scoop on all the great things that will be happening at the hotel so stay tuned. We were sworn to secrecy and our lips are sealed but we will be bringing the news to you very soon. 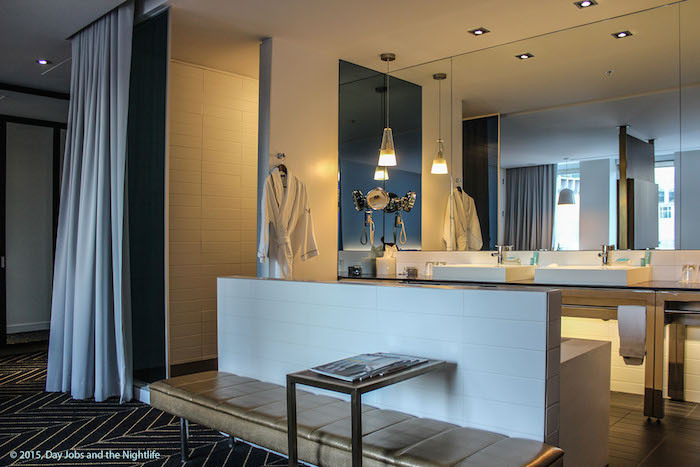 Whether you are an out-of-towner or your looking to enjoy a staycation right here in one of the coolest cities in the world, we recommend that you treat yourself to a night or two at the W Montreal. You’ll walk away refreshed but I will warn you, once you’ve experienced the W Montreal, walking away is harder than you might think. To book a room or for more information, visit the W Montreal website here.